Corneal neovascularization (CNV) is the in-growth of new blood vessels from the pericorneal plexus into avascular corneal tissue as a result of oxygen deprivation. Maintaining avascularity of the corneal stroma is an important aspect of corneal pathophysiology as it is required for corneal transparency and optimal vision. A decrease in corneal transparency causes visual acuity deterioration. Corneal tissue is avascular in nature and the presence of vascularization, which can be deep or superficial, is always pathologically related. 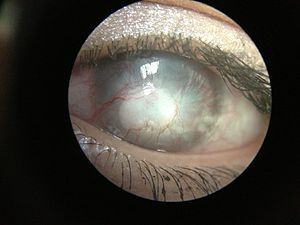 Corneal neovascularization is a sight-threatening condition that can be caused by inflammation related to infection, chemical injury, autoimmune conditions, post-corneal transplantation, and traumatic conditions among other ocular pathologies. Among the causes of corneal neovascularization is believed to be wearing contact lenses for periods of time well beyond what is normal. It is critically important to practice the recommended guidelines for contact lens use. Change the type of contacts prescribed or length of time the contacts are worn. Discontinue contact wear if the case is too severe. Additional tests and treatment may be required if the condition is severe. It is important to have regular comprehensive eye examinations to detect and prevent problems from becoming too severe.